It is important that young people develop the skills and have opportunities to practice working collaboratively with diverse groups, other youth, and community members. Business leaders tell us that the ability to work collaboratively with others and in teams is a primary skill for 21st Century workers. We concede that teaching these skills and having kids work in teams takes more planning and group management than having kids work independently. Thus, it is important that youth workers believe that working in teams allow young people to form a stronger sense of belonging, understand the value they can bring to a common goal, and work “smarter” than when working alone. 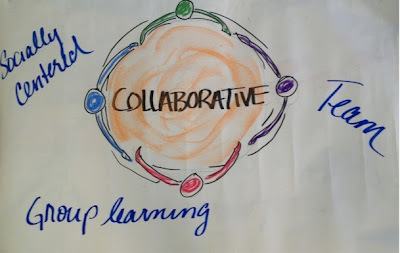 Successful collaborative learning takes skills and practice, and requires that the group members are able to engage in activities in a teamwork setting. Also important are establishing an environment where participants feel safe, but challenged and keeping the groups small enough so that all can contribute. Social skills for effective cooperative work do not magically appear when cooperative lessons are employed. Instead, social skills must be taught to students just as purposefully and precisely as academic skills. Leadership, decision-making, trust-building, communication, and conflict-management skills empower students to manage both teamwork and taskwork successfully. 1. Explore and assess: It is important that you take the time with your staff to explore and assess your alignment with this learning principle. 2. Building a sense of emotional safety: If we expect young people to work positively with one another, there needs to be a sense of trust and safety between them. It is helpful if the group can contribute to a set of group agreements of how they want to be treated by each other. It is important that one of these agreements is “no put-downs” – that when young people disagree or express their opinions, this does not include calling a person a name or any interaction that would cause a person to close down. Promise that you will help them remember and let them know that they can remind each other as well. 3. Active listening through “check-in circles”: You can develop the listening skills of your youth by conducting “check-in circles” at the beginning of your program. This is the time when every participant has the opportunity to briefly share something with the group or respond to a question posed by the group leader. When you first start instituting the check-in circle, it helps to plan a safe and interesting check-in question, such as, “What is your favorite thing to do on the weekend?” or “If you could go anywhere in the world for one day, where would you go?”. Later on, after some practice, you might have each person share one thing about their day or say how the group is working together. You can make use of a “talking” stick or other objects that the speaker holds and only the person holding the object has permission to talk. Everyone else practices active listening by giving eye contact and not distracting the speaker in any way. People with comments or questions can then raise their hands, only when the speaker is finished. 4. Team-building games: In order for young people to work collaboratively with their peers, it is important that they form a positive sense of belonging with the group. This can be built over time using team-building games to foster a positive sense of group and help kids become accustomed to working positively in small groups and working on a common goal. Program staff can draw upon printed curriculum or activity books and begin by leading group games in the beginning of the year. 5. Resolving conflicts: Teach a specific protocol that all children can demonstrate and use when they have a difference with a peer that is problematic. When young people have the skills to resolve conflict in healthy and respectful ways, they are kinder and happier, and require less adult intervention. They also feel safer in the after-school program knowing that they can solve problems together and that they can get help if they need it. You can also train “conflict managers” to help peers or younger children resolve conflict. They also feel safer in the after-school program knowing that they can solve problems together and that they can get help if they need it. 6. Building collaborative skills – brainstorming, prioritizing, and forging agreements: These are things you can teach during your check-in circle. Involve your youth in decision-making, such as the kind of snacks to be served or things to do on “free Fridays”. Allow all the youth to share their idea. “Every idea is a good idea” – let them know in brainstorming that all ideas are to be respectfully accepted. A good brainstorm session collects more ideas than can be used. To prioritize, youth can vote using colored stickers, with each youth having three stickers to place alongside their favorite ideas. The ideas that have received the greatest number of stickers are the ones that will be used. 7. Begin slowly: Begin with simple collaborative projects that can be completed within one session before moving on to more complex projects. What does new brain science tell us about collaborative learning? Dr. Judy Willis is a board certified neurologist, who turned her attention to becoming a classroom teacher. Her goal was to apply what she knew about the brain and learning to strategies that could be developed for the classroom. 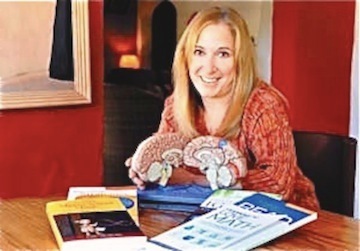 She is now an educational consultant who speaks to groups of people from around the world about the interface between the new knowledge of neuroscience and learning. We were particularly interested in her work regarding why collaborative learning works. “When youth participate in engaging learning activities in well-designed, supportive cooperative groups, their affective filters are not blocking the flow of knowledge. When you plan your group such that each member’s strengths have authentic importance to the ultimate success of the group’s activity, you have created a situation where individual learning styles, skills, and talents are valued and youth shine in their fortes and learn from each other in the areas where they are not as expert. They call on each other's guidance to solve pertinent and compelling problems and develop their interpersonal skills by communicating their ideas to partners. The brain scans of subjects learning in this type of supportive and social learning situation show facilitated passage of information from the intake areas into the memory storage regions of the brain. This is consistent with the original cognitive psychology research and theories of Steven Krashen about the affective filter - that learning associated with positive emotion is retained longer and visa versa. Many of the motivating factors that have been found to release dopamine are intrinsic to successful cooperative or collaborative group work such as social collaboration, motivation, and expectation of success or authentic praise from peers. 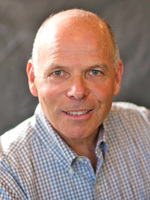 Because dopamine is also the neurotransmitter associated with attention, memory, learning, and executive function, it follows that when the brain releases dopamine during or in expectation of a pleasurable experience or reward, that this dopamine will be available to increase the processing of new information. That is what occurs when a young person enjoys a positive cooperative learning experience, and even when s/he anticipates participation in that type of activity sometime during the class or program. 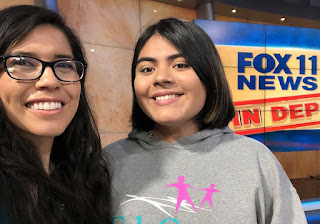 When FOX TV (Los Angeles affiliate) asked local high school students to speak about the importance of Afterschool Programs, they said "Yes!" On Sunday, March 24, Alvaro Cortes, Senior Executive Director of LAUSD's Beyond the Bell – along with students Abigail Miranda (Sylmar HS) and Lynn Kim (North Hollywood HS) – talked with Hal Eisner, the host of FOX 11's News in Depth. They told Eisner how much Afterschool Programs have meant to them and their fellow students. They stated what a drastic blow it would be if there should be a cut to funding for these critical programs. Both Abigail and Lynn were articulate and passionate, and spoke from their hearts. All of the state's high school afterschool programs would be eliminated if President Trump's budget is approved. According to Abigail's EduCare Site Coordinator, Viancha Carchi, everyone listening was touched by her story. We're sure you will be, too! To see a brief clip of the broadcast, click here. To view the full segment which aired on Sunday, March 24, click here. Stu Semigran is the co-founder and president of EduCare Foundation and the executive director of EduCare’s ACE (Achievement and Commitment to Excellence) Student Success Program. 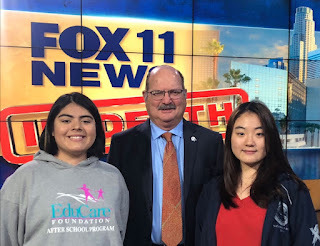 Currently providing student support services at more than 100 high schools and middle schools in Southern California, EduCare also is the grant manager for the ASSETs after school programs at 17 LAUSD Beyond the Bell high schools and 1 middle school. Over 30,000 students are served each year through EduCare afterschool and youth development programs.